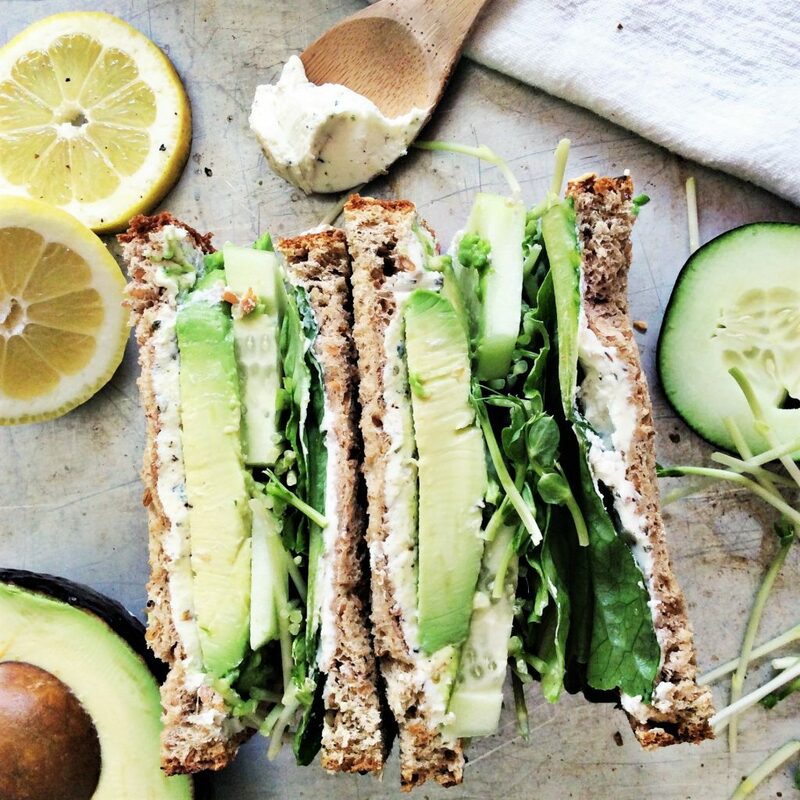 Green Veggie Sandwich – there are some foods that you just come back to again and again. Veggie sandwiches are that way for me. 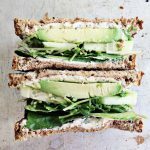 I love discovering new combinations of veggies to put in the sandwich and of course finding some hearty whole grain bread is a must. Now that our kitchen is functional and not in the paint/reno zone, I’m starting to cook more again. Hooray! Luckily I didn’t have to “cook” anything for this tasty meal. 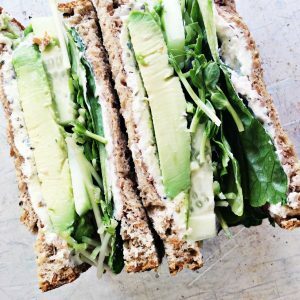 I’ve been testing recipes similar to this green veggie sandwich for a while now and there are many similar ones. I’ve made a couple that only use goat cheese or cream cheese as the spread (no other flavorings) and I was a little let down by the flavor. Goat cheese really needs something sweet to balance it’s creamy flavor. After some experimenting, I think I’ve created a delicious sandwich! It uses a drizzle of cilantro lime dressing (in addition to herbed goat cheese) to really give it a lot of flavor. I’ve found the Brianna’s Cilantro Lime dressing in most grocery stores, but if you have one you love to buy (or make) go ahead and use it! On Amazon it looks like there are a lot of cilantro lime dressing options too. Start by chopping up the cucumbers, lettuce, and avocado slices. Then get to work layering your ingredients! So simple but so fresh. 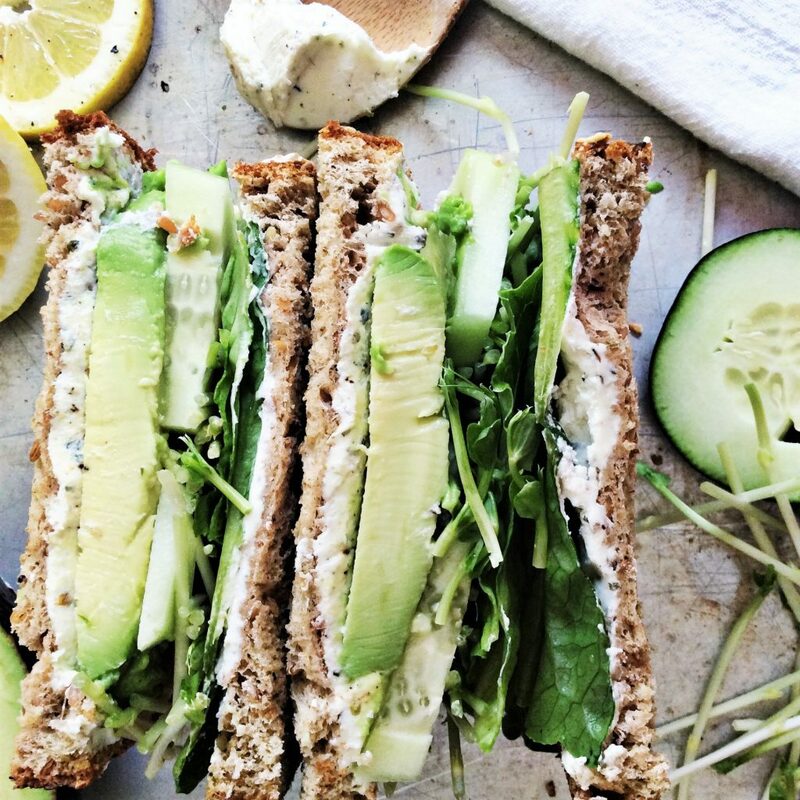 This Green Veggie Sandwich is fresh, crisp, and healthy. Slice avocado, cucumbers, and romaine leaf. Set aside. Spread goat cheese evenly onto each side of bread. Don't use too much! It tastes best with only 1 tbsp. per side. 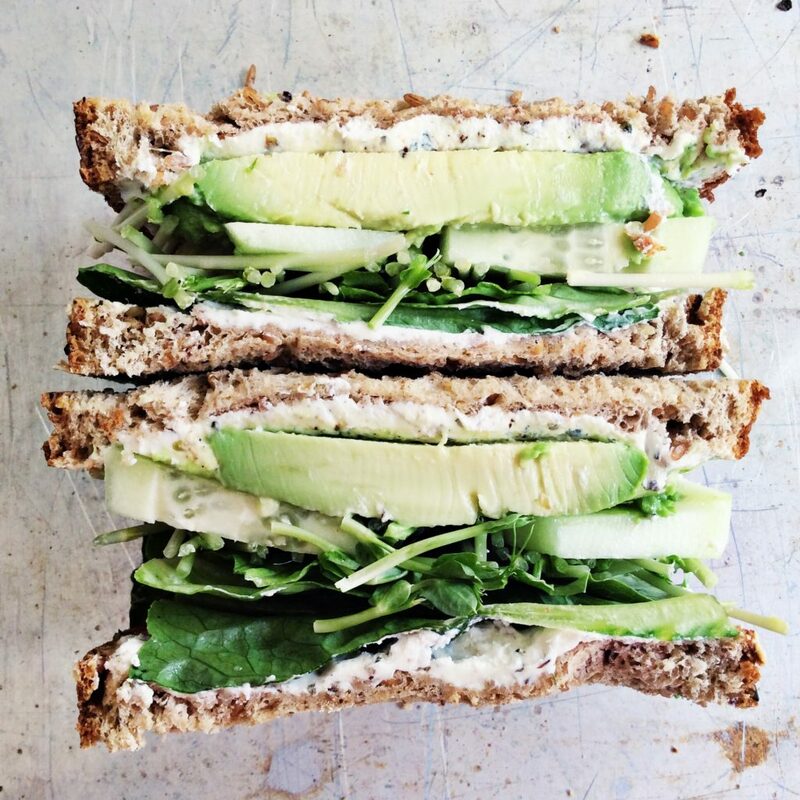 On one side of bread drizzle cilantro lime dressing. Then stack romaine lettuce, cucumbers, a handful of the pea sprouts, and avocado slices on top. Squeeze lemon juice onto sandwich. Slice to reveal the gorgeous green veggies inside. Enjoy! I better end this post before I feel the need to go make another green veggie sandwich. They are that good. And the best part is? You feel good after eating this. One day I had this for lunch and wasn’t hungry until 8 hours later. 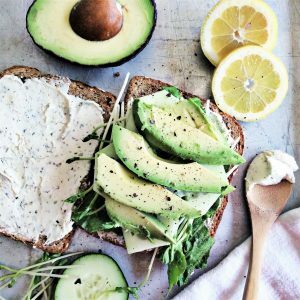 When you choose a good whole wheat bread there is a lot of protein in the sandwich… that with the goat cheese and avocado, you’re left feeling really satisfied. In a healthy non-junk food kind of way.